You can feel proud to send this magnificent gift basket and know that it is going to be well received. 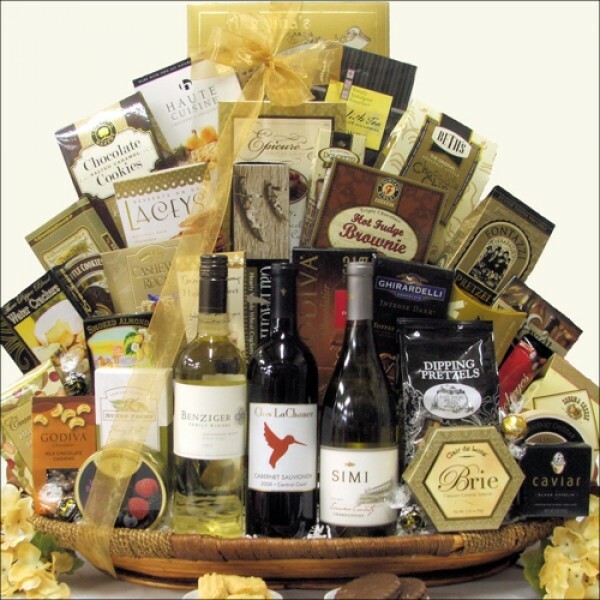 This basket features three bottles of superb California Coastal wines including Benzinger Sauvignon Blanc Lake Sonoma White Wine, Simi Chardonnay Sonoma County White Wine and Clos La Chance Cabernet Sauvignon Central Coast Red Wine. We have accompanied these wonderful wines with a premium selection of gourmet foods including Smoked Salmon, Capelin Caviar, Clair de Lune Brie Creamy Cheese Spread, Three Pepper Blend Water Crackers, Chocolate from Ghirardelli, Godiva & Lindt, and more! A very special basket for a very special occasion.